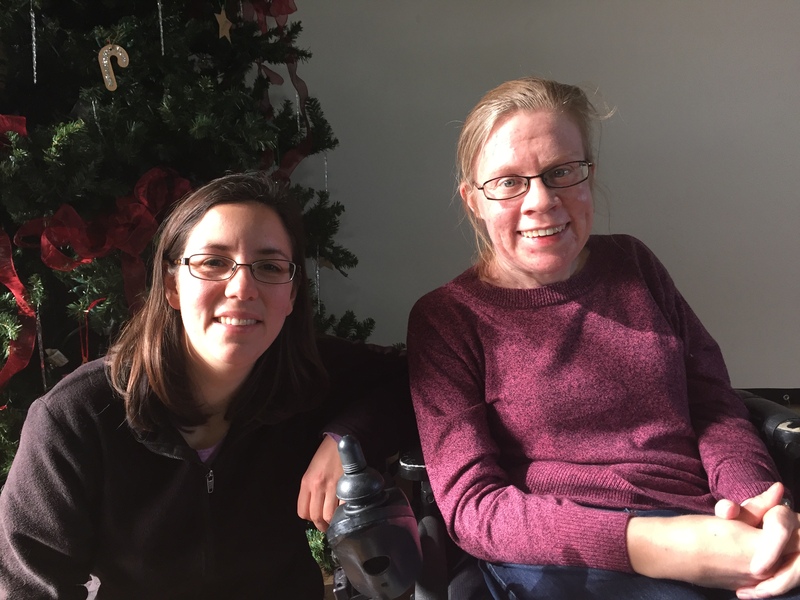 Kara Kahnke (right) poses with Annie Eldon (left). Annie Eldon first came to City Square after meeting former Pastor Rob Rynders at a community event. Rob invited Annie to a City Square Theology Pub where community members of different faith backgrounds hold an informal monthly discussion about different faith topics Although Annie didn’t continue to go to Theology Pub, she did stay in touch with Rob, and attended City Square’s interfaith series and controversial issues series that were held a couple of years ago. Ultimately, she made the decision to make City Square her home church when another church she was attending got bigger than she preferred and lost its strong small community feeling. Annie grew up Christian, but chose to stop attending church at 17 because she felt her church was too focused in talking about the Iraq war, which made her uncomfortable because she didn’t support the war. However, when she began to have some health problems a few years later, she felt it was a call to return to church. She tends to seek out newly forming churches because of their commitment to strong communities. City Square recognized Annie for her own community involvement. She received the Co-creators Cup, which is a special award the church offers to congregation members who make an extra effort to bring people closer to each other and to God. Recipients of the Co-creators Cup eventually pass it along to the person they believe is most deserving. Annie participates in a bicycle advocacy group that promotes bicycle awareness, infrastructure and education. She has also helped with various events in the Coronado neighborhood such as the recent Porch Concert Tour, at which several neighbors hosted bands in their homes. Within the church, Annie helps out when needed, and participates in the Beer Brewing and Spiritual Formation small groups.